Springbar Highline 8 Tent is a cabin style waterproof but breathable canvas tent designed for a 4-season use and suitable for camping in all climates. 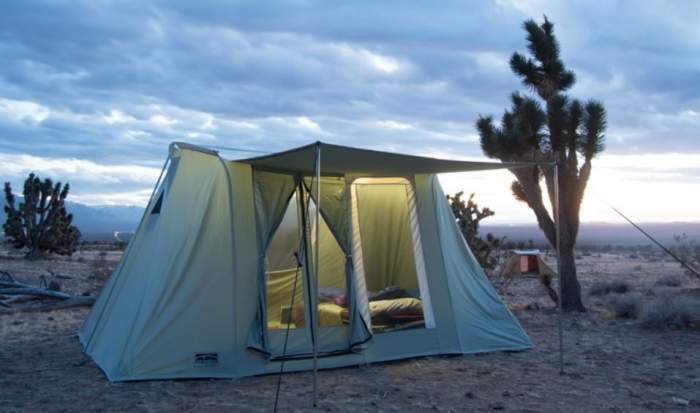 The Springbar Highline 8 is a canvas tent, non-freestanding, and a cabin style. 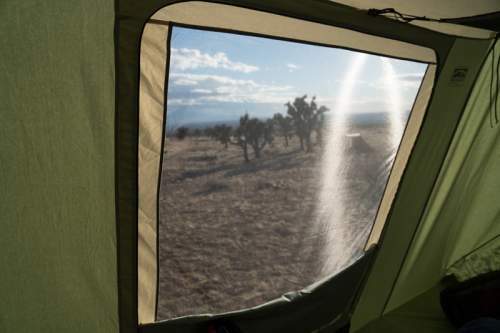 In view of its material, you could call it also a dark rest tent because glare is considerably reduced inside. This is a single room structure and you have one double door plus a very tall window next to it, plus windows on the back. They are the two-layer type, with mesh against insects and with canvas for protection and privacy. The rest of the tent is a single layer type as typical for canvas tents. Note that you also have an awning (shown in the picture) which is a separate piece on the front and not just the door flap. So you can roll it up and fixed above the door if not in use. The dimensions of the awning (depth x width) are 71 x 88 inches (180 x 224 cm) and this is a huge space for sitting in the shade. 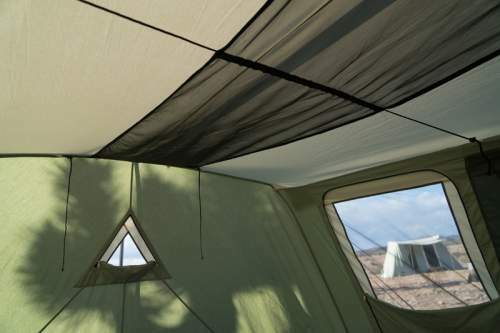 A similar awning design you can see also on yet another canvas tent, the Jet Tent F25DX 10. The package includes the following: the tent and awning, carry bag, poles with their carry bag, steel stakes with a carry bag, awning ropes, adjustable gear-loft, and owner’s field guide. The whole structure is supported with only 2 legs (vertical poles) on the two sides. In the case of parents and two kids, you would have plenty of space. Note that such straightened and tall walls are perfect for bunk cots, you will save lots of the floor area and still have the place underneath the cots to store the gear. Seasons-wise, this tent is built for 4-seasons and this should be taken literally. It is breathable and the fabric creates a cool atmosphere so this makes it suitable for a summertime camping. 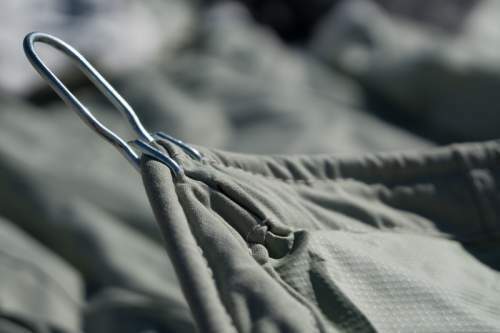 Such a material also makes it a bit insulating, at least as much as you can expect from any tent and certainly more insulating than any synthetic material, and this makes it good for winter camping. The frame is steel and very strong so you can be sure it can take a lot of pressure. But this is not an insulated tent; if you need something of that kind, check the Crua Loj 6 tent. Climate-wise, this is related to the 4-season design mentioned above. Such tents are far superior to synthetic tents if you plan to use them in various climates. They work well both in a warm and in a cold environment. So I have included it in my list of cold weather tents. Weight-wise, this is a heavy item which weighs 84 lb (38 kg). It is also rather bulky with its packed size of 43 x 13.5 x 13.5 inches (109 x 34 x 34 cm). So regardless of where you use it, you will need a car for this tent. But in spite of its weight, one person can set it up easily, you will see this below. The walls are breathable but sometimes this may not be enough, in particular, if you have to keep the doors and windows closed. Though the front awning protects the door and the front windows and you can keep them open almost all the time. But they have added two vents on the side, one is visible below, they are with mesh and you can keep them open all the time. One of the side vents. All the openings are with a mesh against insects. The double front door has two mesh windows on it, and you have a huge mesh window next to it as you can see from the pictures. There are also two large mesh windows on the back side. So the tent is very pleasant with so many openings and you can regulate the amount of light with the flaps. Observe that the awning is not the door flap, the door has its own panels for protection, with the zippers so if you do not need the awning you just roll it above the door. The tent’s body is a 100% Cotton Duck Canvas and you have 10 oz for the roof and 8 oz for the walls, so the thickness is slightly different. It is finished for water repellency and anti-mildew. It is supposed to be watertight yet breathable, and it is very durable. They write about three separate types of thread and lap-felled seam construction which are there to prevent leaking. The floor is synthetic, so you have a heavy-duty fully waterproof 14 oz laminated vinyl. All the openings have a No-See-Um mesh against insects, see the picture above, plus canvas covers. Here is one of the two vertical (leg) poles and its connection to the T-shaped springbar roof pole. There is a rope sewn in here along the perimeter for durability. The poles are very specific to this model, but you will see the same system used also in the Kodiak 8 tent. There are only two main galvanized steel poles on the sides, which support the tent. 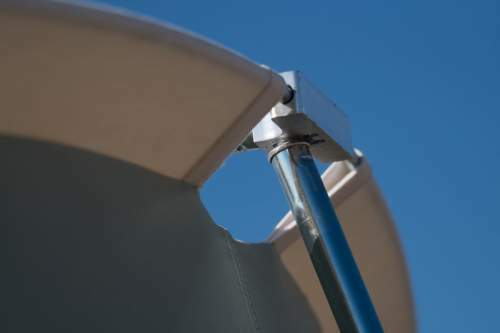 Somewhat similar is also the system in the Teton Sports Mesa series, but the important difference is in the main roof tubes and their connection. 4 solid steel zinc plated spring rods. 2 roof tubes with the T-shaped ends, you see one in the picture above. A third tube that overlaps the two T-tubes’ connection and when you position it properly you will hear clicks which mean that it is locked, so this is a very strong structure. The package includes 12-inch steel nail stakes. The picture above shows also one of the steel wire loops which are combined with the perimeter rope reinforcement sewn in the canvas. (Sort of ) Dark rest. I guess it is important to stress that they offer a LIFETIME WARRANTY that covers defects in materials and craftsmanship. As of the moment of writing this text, the price for this tent on Amazon is $749. So it is considerably more expensive than the Teton Sports Mesa 14 tent which is built in the same style. Type: non-freestanding canvas cabin tent. Weight: 84 lb (38 kg). Dimensions: 14 x 10 ft (427 x 305 cm). Area per person (for 8 people use): 17.5 ft² (1.6 m²). Packed size: 43 x 13.5 x 13.5 in (109 x 34 x 34 cm). In the summary, this Springbar Highline 8 Tent is a great tent built to last and you will use it for years. If you want to see how such a tent may look after 17 years of use, see here, note this is the smaller version but the same design. So the current high price might be a great investment and it will pay off in time. I have included this tent in my list of best canvas tents for camping. You might want to compare it with this White Duck Outdoors Family Explorer Basic built in the same style. If you need to see more canvas tents, check in the category Canvas Tents. In particular, see this DANCHEL Cotton Bell Tent with Two Stove Jackets which is ready for a wood stove and also this Kodiak Canvas 12×9 Canvas Cabin Tent. Check my list of tents for cold weather, this tent is included there as well. 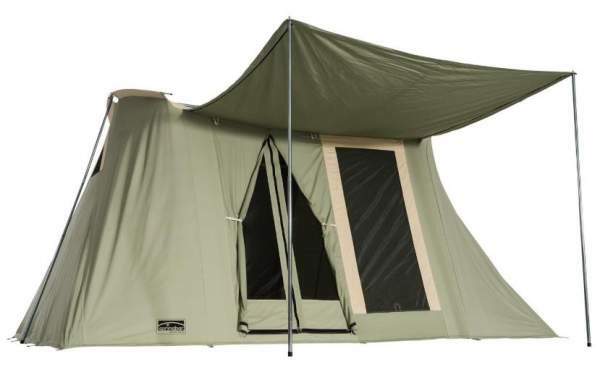 Please share your thoughts if you have any experience with this or any other canvas tent, there is a comment box below.